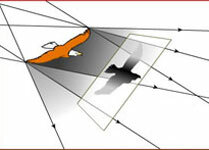 Why doesn't the shadow of a bird form in air?, what has umbra and penumbra got to do with it?. Actually everything. This animated school science topic gives in-depth information about shadow formation through ray diagrams and a common example. Very useful for students to understand concept of umbra and penumbra. How a shadow is formed ? 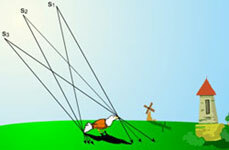 Why a flying bird does not form a shadow on the ground ? Why the shadow becomes darker as an object nears the ground ? No shadow of a flying bird ? For a shadow to be formed on a screen, no light rays should reach that area. Sun is an extended source of light and for an opaque object to form shadow it should obstruct the sunrays from reaching the earth. Please refer the animation.